Squidix Web Hosting Review 2019: Is Squidix Web Hosting a Good Hosting? Squidix Web Hosting is one of the few independently-owned American web hosting providers with a full range of easily-scalable packages. Their plans are simple yet feature-packed, and their reliability and transparency make them a crowd favorite. Founded in 2010, Squidix Web Hosting is an independently-owned American web hosting company with a full range of shared, semi-dedicated, reseller, VPS, and dedicated hosting packages. Their plans are simple yet feature-packed, and their reliability and transparency make them a crowd favorite. Squidix Web Hosting is headquartered in Indiana, United States. Their service is only available in English, but they serve a worldwide customer base that includes countries such as India, Brazil, Iran, and Morocco. I especially liked that they offer a combination of CloudLinux OS and CageFS with their shared hosting packages. This essentially works to split a shared server into multiple segments and contain each user in their own “cage” (hence the name), guaranteeing that every user can utilize the resources they pay for to the fullest. Unlike many hosting providers that oversell their shared servers and thus compromise on performance and security, with Squidix you’ll hardly notice that you’re on a shared server. Further, Squidix includes CloudFlare CDN with all shared hosting accounts, ensuring that no matter where your visitors are located relative to the host server, they’ll always have optimal website loading speeds. What I didn’t like about Squidix, however, is that they don’t appear to have anti-DDoS attack mitigation in any of their shared, semi-dedicated, VPS, or dedicated hosting packages. With DDoS attacks becoming increasingly more prevalent these days, it seems that any of the rare occasions of server downtime you’ll experience with Squidix will be because of these attacks. Additionally, there’s no website builder included with their shared hosting packages. With Squidix Web Hosting, you’re paying a premium for higher quality service. While at first glance their shared hosting prices may seem very low, further investigation reveals that you must sign up for a minimum of three years to get their lowest rates. Then again, given their provision of unlimited resources, unlimited free SSL certificates, and even the rarely-found CloudFlare CDN feature, I think they’re well worth the price. 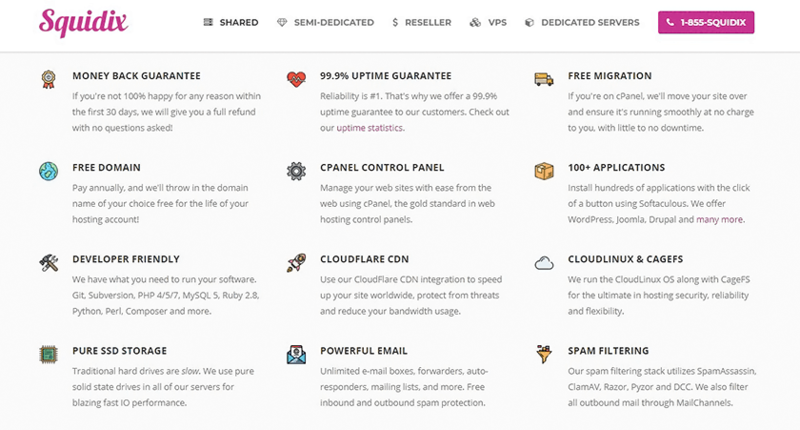 There aren’t any free plans available, but they do have a 30-day money back guarantee on all shared, semi-dedicated, and reseller hosting packages. You can also conveniently upgrade or downgrade your plan at any time directly from your client interface. Squidix’s customer support is one of the best things about their service, and the reason that they’ve been able to grow their customer base year after year primarily based on word of mouth. They’re extremely responsive, generally replying to tickets in less than half an hour (though if it’s a complicated issue, it may take longer than that). They also have a toll-free hotline, though this is only available from 9am to 5pm EST Monday to Friday. I’d recommend being as detailed as possible about your issue whenever you do contact them; in my experience, this minimizes the amount of back-and-forth emailing and enables them to resolve the problem much faster. Squidix doesn’t offer live chat support, sadly. With their commitment to quality and solid customer support, Squidix Web Hosting stands as one of the best options in the market. Unfortunately, given that they’re a U.S.-based provider and don’t offer support for any other languages, foreign users may find it difficult to work on their platform. Wondering how Squidix Web Hosting stacks up against other Web Hosting companies? Enter any other Web Hosting company and we will give you a side-by-side comparison.